Most days, our lives are very busy. Bryson is running all across the country (or NWA) shooting video. I am running all across campus going to meetings. Even in the busyness, there are moments where that longing stops me in my tracks. Sometimes, it happens when someone says, “I envision that our kids will be friends.” Such a kind comment to say. I love that people envision our family together. So that moment happened this week–the moment where I am talking–and suddenly I am reminded that my child is in another country far away. I stop in my tracks. I was in the “welcome back” meeting with the business faculty. We told each other what we did over the summer. “I went to Ch!n@ for professional development and learned a ton to use in my marketing classes. But the trip had such personal significance too because as we traveled from place to place, I kept thinking, ‘Somewhere in this massive country, my son or daughter is waiting. '” I choked up and so did the colleagues that I am closest to. You see, there really is a child or children in an orphanage who have no idea two people in Arkansas are waiting to be their parents. One or two kids who don’t know what it means to have a mom or dad will–it will be us–and we get to teach them what it means to be a family. The word awesome is overused, but this is truly awesome. I cry in awe that God would pick us. I am so thankful, though, for dreams. Since we began this process and started praying for God to direct our steps, B started dreaming. This guy never dreams. But, he saw our child sitting on the counter while we cooked in the kitchen. The child was a little girl. Last week, a friend in Ch!n@ had a dream. This is the message she sent me: I had a dream last night that you and Bryson got news that you’d been matched with a sweet little girl. In my dream I offered to tag along as interpreter (like u need that, I am sure the agency has them!) but it was awesome to “get to be there” as you guys met your sweetheart. I truly believe the Lord gave her that dream at a moment where we needed it–we needed to hear from someone else. Someday, friend, I’ll tell you why. And then on Thursday, I had a vivid dream that my social worker sent us a little girl’s file to review via email. In my dream, she told us how precious she was, that she had met her during her time in country (my SW goes next month), and thought Bry and I would be a perfect fit for her. I think it is especially awesome that I woke up from my dream before I read her “medical need.” Another dream of a little girl. And in all of our dreams, there was only one child. Who knows, maybe we will be matched with a boy. Who knows, maybe we will adopt two at a time (but God is going to have to hit me over the head to convince me). However, I love these dreams. I hope my little one is somehow having dreams about us too. After all, our child is a beloved child of God too. Although the dreams whisper hope and excitement for our future, I am living and operating in the present. My prayer has been, “Father, show me what faithfulness looks like right now.” I am in a position of a lot of responsibility, and I have a lot to get accomplished. It would be easy to only focus on my dreams and neglect the present. I am grateful you dream with us for our future and love and work with us in the present. What are we waiting on: We are still waiting for a referral…Earlier, I posted that we could receive one any day or 6-7 months from now. I talked with my awesome social worker last week, and the time frame looks more like November-May to receive a referral. We would travel to adopt him or her 2-6 months after that. Of course, this is adoption, and adoption is completely unpredictable, so this could vary drastically. I am going to be honest, some days, it is really hard not knowing when we will receive a referral or when we will travel. What are we working on (adoption related): School is about to start. I am living in my office these days. What are we reading: I am prepping for school. How you can pray for us: For peace and encouragement during the wait. I pray every day for protection for our child – I pray that his or her nanny dotes on him or her, and that our child has a strong attachment to her. The Titus Task is excited to announce that the Moore Family has been chosen to receive a matching grant for their adoption. The Titus Task is a registered 501c3 organization dedicated to pursuing a future for orphans. One of the ways we do that is by raising funds and giving child specific adoption grants to NW Arkansas Families. Since 2009, we have given over $100,000 to 18 families in NW Arkansas. We would like to ask you, as friends and family of Mandy and Bryson, to help us make a difference in the financial aspect of their adoption. The Titus Task will give one dollar for every dollar that is donated by friends and family up to $2,500, making the total amount to be given $5,000 (or more)! Most of our board members are adoptive parents and we know first hand what a wonderful gift of encouragement it is for the financial burden to be lessened during adoption. Caring for the orphan happens in many different ways – please know that your gift makes a huge impact! Mandy and Bryson are living out their faith in caring for a child from China they will soon welcome home. Will you join us in showing love for this family? We are excited to partner with you as we witness the miracle of adoption and watch as God provides for those He loves so deeply. May He be glorified. To make a Tax Deductible donation by Paypal please use this link: https://www.paypal.com/cgi-bin/webscr?cmd=_s-xclick&hosted_button_id=TNV2NR33ER65N or mail checks to the address below (if you mail a check, please make sure you write “Moore Family” on the memo). Please make donations by September 16th. Thank you for your consideration and generosity! We don’t know who you are just yet, and your dad and I cannot wait to know your Ch!n3se name, to see your face, and to hold you. For the past 10 months, we have prayed for you–for your safety, care, and well being. In this wait, we have also prayed for your birth family–we thank God that they brought you into this world and gave you life. I think of your birth mother often, and my heart is overwhelmed with love and gratitude for a woman I’ve never met. And even though I don’t share the same language as your birth mom–we will both be an important part of your story. She is such an important part of my life’s story too. I know someday soon, you and I will be together and you will join in my prayers for her. As hard as it has been to be patient in the wait, I have also realized how necessary it is for us. Your dad and I have learned so much about a part of the world that is so far away from us and we have also learned how to best care for you. Each day, the Lord has been molding our hearts in ways that were very different than just a year ago. He has been preparing us for you. During this time, your dad and I have also experienced new and challenging situations–situations that we as a family will someday navigate together and that as you grow older and go off to school, you will have to navigate. On a rare occasion, we have needed to respond to racist “jokes.” They hurt us for you. Other times, we are overwhelmed with people’s questions about adoption; questions that are worded in ways that hurt. And while we have tried to educate people about becoming a transracial family and the miracle of adoption, we are very aware that you will also have to respond to these questions someday. I am so sorry that some people do not understand adoption. I am so sorry that some people don’t see the beauty of diversity. I am so sorry that some people sometimes let curiosity get the best of them. They need to think before they speak. I am so sorry that some people have a hard time understanding that families are formed in ways that are different than theirs. I am so sorry that sometimes, people upon first meeting you will ask about deeply personal and private things in your life. It is okay to say that it is private. I am so sorry that sometimes, people will try to figure out what your issues are because they think kids who are adopted have issues. I want you to know that every person has issues. You are wanted, cherished, longed for, and pursued. Your dad and I pray so much for you, and we cry because we long for you to be placed into our family. Your birth mother gave you the gift of life. Your skin color may not match mine, but you are lovely and worthy. Your story might be different than other kids, but the One who created you adores you. You are so precious to Him. You are precious to us. Families are formed in different ways–and while it is sometimes hard being different–it is really beautiful too. I want you to know that for many people, if they knew better, they would do better. Yes, there are some people who are bigots and racists. There are people who lack manners. And for them, there is no excuse. Being of a different generation is no excuse. But, there are also people that we will have to educate. We will help some people know better and do better. Sometimes, we will need to patiently tell people for the 100th time that the term is not “real mom” but “birth mother” because no one else has ever told them otherwise. 90% of the people would do better if they knew better. I want you to know that you are my real child. You are my own, even though we are not biologically related, you are my family. I will be your real mom. And your birth mother, she is real too. She is so important to us. I want you to know that you weren’t a project for us. When we asked God, “Where is our child?” we had dreams of you in Ch!na. Out of the entire world, the Lord started showing us the way to you. Your dad never, ever dreams. When we asked God, “Where?” your dad had the most vivid dream of us cooking in the kitchen while you sat on the counter. He saw your face. I want you to know that even though sometimes people will say hurtful things, many have no idea that they are hurting you. It doesn’t excuse their behavior, but we have to help them see. And even though there will be people who ask you questions…lots of questions…and sometimes say hurtful things, I want to tell you how often I am reminded of the goodness and beauty of people. Some people will make you cry because of the hurtful things they say, but some people will make you cry because of the loving things they say. There are so many people who do better, who overwhelm us with love and compassion. There are many who celebrate the miracle of adoption. There are people who will respect your privacy and your story. There are so many people who will love you. And while it is so easy to get angry at this world and the ignorant things people sometimes say, I pray that the Lord will give all of us grace to educate others and love them. I pray that we would never get used to the beautiful things people say. I pray that we will also see the ways the Lord has placed lovely people in our lives who say the most beautiful words to you. When I encounter people who say ignorant or ugly things and I encounter people who say encouraging things and love us, it shows me clearly that I want to be a person of love, beauty, acceptance, and respect. Love wins. I am so thankful that so many people see that adoption is a miracle. I am so thankful that many people see the beauty of diversity. I am so thankful that many people respect our privacy and your story. I am grateful that many people think before they speak. I am so thankful that many people celebrate that families are formed in ways that are different than theirs. And, I am thankful for parents who teach this to their children so that we don’t have to. I am so thankful that most people in this world celebrate that we are each so unique and different. I am so thankful that so many people are praying for you. I am so thankful that there are so many people in our community who have adopted us into their family–even though we are not biologically related, they love us (and you) as their own because we are. Each time I answer people’s questions or respond to their statements, I am trying to do so in a way that shows just how much I love you and how grateful I am that the Lord showed us the way to form our family was through adoption. You were never plan B.
Cravings this week: We have been craving China Cafe in Springdale – dry fried green beans and honey pepper beef. Best news of the week: We are L-I-D.
What are we waiting on: We should hear whether or not we received a grant this week. We are praying for provision. We are also waiting to receive a referral. We could receive one quickly or 6-7 months from now. What are we working on (adoption related): We have a lot of big stuff at our house that needs to get done before we adopt. We need to paint our fence, our concrete countertops are cracking and breaking apart (note: don’t install concrete countertops in your kitchen), and we need siding because the squirrels are eating our wood siding. We also need to figure out important stuff like a pediatrician in our area. Any recommendations? Fun things we did this week: I had dinner with some other Ch!n@ adoptive mommas this week that live in our area. Just really special times. When I started this journey, I prayed so much that there would be other China adoptive moms in my area that were also waiting. We found each other on Facebook. I cannot wait to see our kids play together. Just such an answer to prayer from my gracious God. How you can pray for us: Please pray for our child – for protection, that they receive love and care, that they have enough to eat, that they are held and develop a bond with their caregivers. Please pray that the Lord will magnify our discernment and that we will know whether or not we are meant to be the child’s parents when we receive a referral. Please pray that we have peace during the wait. It’s hard. 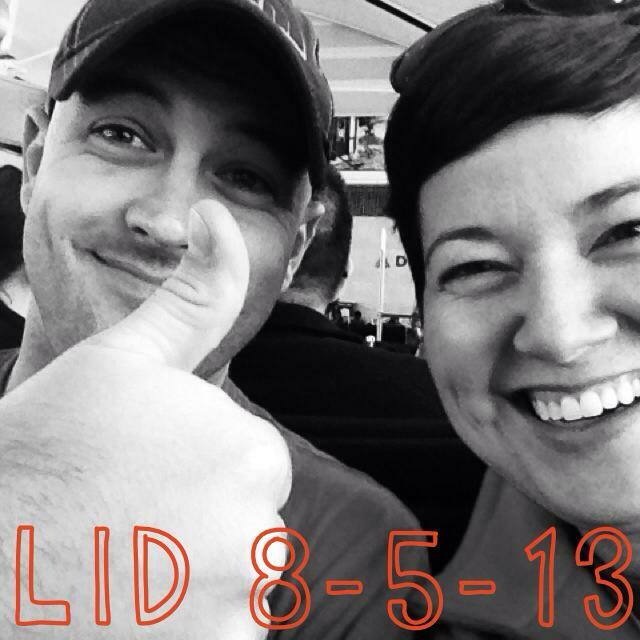 LID – What does that mean? Yesterday morning, I woke up and do what I always do – say good morning to B and check my personal email. It’s true. Adoptive moms check their email 10 times per day to see if their social worker has any updates. The two days prior, I was out of town for work. If I had received the email then, we wouldn’t have been together to celebrate. We expected to be notified one of those two days because our agency receives LID updates on Monday and Tuesday. By Tuesday night, I thought we’d have to wait until next week. So we were so surprised and excited! Unanimously, we said, “Wow, we are going to be parents!” Surely after 10 months of paperwork we knew this, but still, this moment made it very real. Suddenly, all of the projects we have to do around the house became urgent. So what does it mean to be LID? It means that the country we are adopting from received all of our paperwork and has logged it in. It also means that we are eligible to receive a referral for a little boy or girl. SO how did you feel when you received LID? I cannot express how excited we are. B has been smiling a smile that is bigger than I have ever seen before. We have such hopeful anticipation. Will the referral be for a little boy or little girl? Yes. Ha! We don’t know if the referral will be for a little girl or boy. For this super planner, this is a test of patience. But, I am passing. Well, when will you receive a referral? We don’t know. This means that we will have our cell phones on us at all times waiting for “the call” from our social worker. Honestly, we could receive a referral any day or six or more months from now. This is better than anything I have ever experienced. I am so excited to wake up each day. So what happens after you receive a referral? We will review the child’s file. The file includes some medical records that we will have reviewed by an international adoption physician to help us understand the child’s medical needs. If we feel as though the Lord is calling us to adopt this child, we will write a letter to the government of the country we are adopting from. And then we wait for them to give us provisional approval (PA). Once we receive PA, we will be able to tell you and share his or her photo (unless the rules change). So how long after you receive PA will you travel to adopt your child? We have no idea. It could be fast — 2 months or a long time — 6-7 months. We will have approximately 2-3 weeks notice before we travel. The steps leading up to travel typically have predictable wait times, but still not much notice. Thanks for celebrating with us. Please join us in praying that the Lord MAGNIFIES our discernment–that when we receive our child’s file, we will know. Best news of the week: Lately, B and I have been faced with opportunities to recognize and appreciate that we are on the same page in our adoption. We have also recognized how different we are, and how in the adoption process, it is very complementary and good. According to our agency, it seems as if there is some movement this week. What are we waiting on: We are waiting to receive our log in date (LID). Our Social Worker is going to check the database tomorrow or Tuesday to see if there is any update. It would be AWESOME if we had LID tomorrow morning because tomorrow night, Ch!n@ releases their list of children, which means we could be matched with a child. We are also waiting to hear if we received an adoption grant. What are we working on (adoption related): When we started this process, we assumed we would be matched with a girl. However, we have learned that there are so many little boys who wait and wait and wait in orphanages. With our agency, the wait time to be matched with a girl is around 6 months, but to be matched with a boy, it is about 1-3 months after LID. We are most definitely open to a little boy or girl. So that means now we are praying and talking about little boys’ names. LydiaGrace (middle name Chinese name) Moore if a girl and ?????????????? if a boy. It is important to us that the name have an important meaning behind it. What Ch!nese words are we trying to learn: I have been learning Mandarin words for parts of the body – knee, toe, head, heart, lungs, etc. But, a funny story…yesterday, I was looking for B out in the backyard. So I yelled, “B!” And I thought to myself, “Cool…my tone sounded just like I said zero in Mandarin.” These are the thoughts when learning a tonal language. Fun things we did this week: B and I so enjoyed our vacation and time with friends and family in Colorado. I so needed to get away with him. This week, we went on a date and out to see a scary movie. It is nice to have moments where we are just normal.